Are you a “mouth breather”? In other words, do you breathe primarily through your mouth? It’s a little-known fact that many people in Western countries have been conditioned to breathe through their mouths (breathing through your nose is healthier, but that’s another story). But some people have no choice but to be mouth breathers – because their nasal passages are permanently blocked. Permanent blockage of the nasal passages can lead to sleep apnea. This was the case for Bob, a 39-year-old who lives in Holland, Michigan, U.S.A. In today’s lesson, I’ll be explaining how nasal surgery can cure sleep apnea – and how Bob dealt with the consequences of the surgery. For some, blocked nasal passages never pass. Nasal congestion or obstruction is constant, causing them to breathe with an open mouth. Unfortunately, partially closed or congested nasal passages can result in snoring and sleep apnea. Within the nose, there’s a dividing wall between each nostril. That wall is made of cartilage and called a “septum”. The term “deviated septum” is usually associated with a broken nose. But this condition may occur naturally without injury. This is one way that the nasal passage can become blocked and lead to sleep apnea. The odd shaped items in the nasal passage are called “turbinates.” These can be thought of as “shelves” running from front to back in the nose. Turbinates consist of spongy bone covered with a tissue and with blood capillaries close to the surface. The tissue itself is a thin mucous membrane. In dry weather or with hard blowing, capillaries may rupture, resulting in a bloody nose. Whether the result of injury, naturally occurring excess tissue, or inflammation and infection, enlarged turbinates can obstruct breathing. Nasal surgery as a treatment for sleep apnea often involves the septum or turbinates. A common problem corrected by surgery is the straightening of a deviated septum. The process involves breaking and use of splints to straighten the septum. Surgery on the turbinates involves surgery with a scalpel or laser to reduce the size of the turbinate tissue. A recently-developed process uses high frequency radio waves to reduce spongy bone underneath the mucous membrane. Surgery involving laser or radio waves obviously produces less bleeding than surgery with a knife. A casual observation of Bob reveals he is not overweight. In fact, he is in reasonably good physical shape. At 180 lbs and 6 ft tall, Bob has an average build, perhaps on the thin side of average. His neck is neither thick nor short, which are typical of many sleep apnea sufferers. Bob’s case involves nasal surgery which corrected his sleep apnea. However, Bob was not even aware he suffered from sleep apnea. For many years, Bob snored quite loudly, bothering family and spouse. It was a bad sinus infection which prompted him to seek medical care. Bob’s doctor suspected sleep apnea, and sent him for a sleep study. The results of the sleep study confirmed a moderate incidence of sleep apnea with 20 episodes per hour of short (4-5 second) duration. Following confirmation of the results, Bob’s doctor explained that the cause of his apnea was related to nasal and sinus blockage. He recommended nasal surgery to clear the blockage. Following surgery, Bob awoke with no discomfort. He said it was like waking from a nap. But Bob wasn’t prepared for the post operative pain. The main area of pain was his upper teeth, where nerves connect with the sinus area. In addition, while accustomed to sinus pressure and pain, the level of pain after surgery was far more than ever experienced. Medications reduced his pain and within several weeks the nuisance of splints and drainage replaced the pain. At some point, Bob was able to breathe through his nose even with the splints in place. This was new to him as mouth breathing was more normal. Within a month, pain and discomfort had all but disappeared. With the splints removed, Bob was breathing better than anytime he could remember previously. It has been more than two years since Bob’s surgery. The main side effect of the experience is sensitivity to dry air, requiring a saline spray or gel. This side effect is minimal compared to the improvement in his breathing. Of more importance, the sinus infections normally occurring 3-4 times a year have disappeared. Frequent, dull headaches, which were normal for Bob, have ceased altogether. His assessment of the success is a “night and day” change. In “Cure Your Sleep Apnea Without CPAP: 9 Survivors Tell Their Story“, you can learn more about Bob’s surgery, and follow his action steps to cure your own apnea. 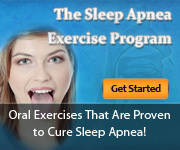 You can also learn about 6 other proven methods for curing your sleep apnea.